On 9 March 2015, Jigme Gyatso was detained by Chinese authorities on several charges, including for being involved in activities aimed at ‘splitting the Motherland. 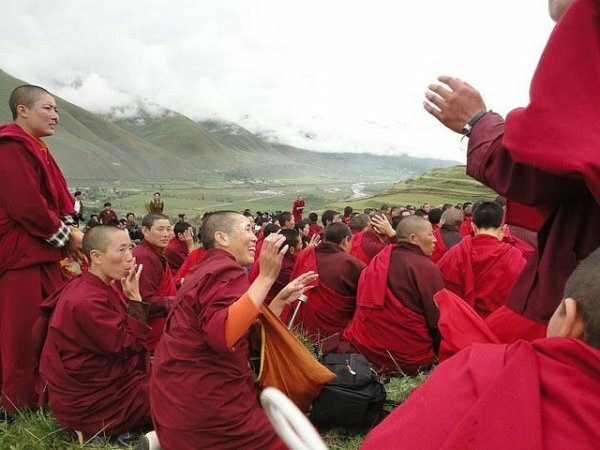 The Tibetan monk, who is a chant leader at the Chone Dethang monastery, was released on bail on 20 March. However, he will be arrested again once his term as chant leader is finished. A Tibetan monk detained last month by police in northwestern China’s Gansu province has been released on bail, but authorities warn he may still face trial and will be taken into custody again, sources said. Jigme Gyatso, chant leader at the Chone Dethang monastery in Chone (in Chinese, Zhuoni) county in the Kanlho (Gannan) Tibetan Autonomous Prefecture, disappeared after being detained on March 9 while traveling to another monastery, a Tibetan living in Switzerland told RFA’s Tibetan Service. “He had left his monastery on March 6 to visit Labrang Tashi Kyil monastery to attend a long-life prayer service for his spiritual teacher, Dethang Khen Rinpoche,” RFA’s source, named Sonam, said, citing local contacts. “After 11 days, it was learned he was being held in the Chone county detention center,” Sonam said. Suspected of planning a protest to be held on March 10, the anniversary of a failed 1959 national revolt against Chinese rule, “he was later accused of involvement in ‘activities to split the Motherland’ and was beaten and tortured by police,” Sonam said. Gyatso was released “on bail” pending trial on March 20, Sonam said. Gyatso, described separately by The Tibet Post International as being 39 years old, had written several times to the Chinese government complaining about official failures to abide by political rights guaranteed by China’s constitution, Sonam said. He completed his Buddhist education at Labrang in 2009, and in 2010 was appointed to a six-year term as chant leader at Chone Dethang monastery, he said. Sporadic demonstrations challenging Chinese rule have continued in Tibetan-populated areas of China since widespread protests swept the region in 2008, with 138 Tibetans to date setting themselves ablaze to oppose Beijing’s rule and call for the Dalai Lama’s return.